These balsamic sauteed tomatoes and peppers are the perfect filling for fajitas, tacos, or burritos, served over rice, or even just by themselves. Balsamic vinegar is my new obsession. I don’t know how I made it 33 years without it being a staple in my kitchen because it is delicious and so versatile. I’m going to let you in on a little secret here too: I don’t care much for bell peppers. I love the smell of fresh ones, but if given the choice, I usually won’t eat them, but these? I actually ate a burrito with just this in it for dinner. No meat! No cheese! WHO HAVE I BECOME?! This is one of those recipes that takes very little time, effort, or ingredients. A balsamic reduction is added to sauteed peppers, onion, garlic, and tomatoes. That’s it. That’s all there is to it. Which goes to show that sometimes the best recipes are the simplest ones. Start by slicing your onion, slivering your garlic, and seeding and slicing red and green bell peppers and tomatoes. You could also use a bag of frozen onions and peppers. I wish I could convey how good these smelled through your monitor. Mix together balsamic vinegar, brown sugar, and soy sauce and let it boil for about 15 minutes. This is the consistency I like my reduction, but you can let it boil longer if you want a thicker sauce. The end goal is to have half the amount that you started with. While the reduction is reducing, saute the peppers, onions, and garlic in olive oil on medium heat for 5-10 minutes before adding the tomatoes. Add the balsamic reduction to the pepper mixture and let simmer for a few more minutes. Serve sprinkled with sea salt, cracked black pepper, and fresh cilantro, if you are so inclined. Sauteed bell peppers, onions, garlic, and tomatoes are simmered in a balsamic reduction for a healthy side dish or filling for your favorite Mexican food. Slice the onion, sliver the garlic, and seed and slice red and green bell peppers and tomatoes to the desired size. You can also use a bag of frozen onions and peppers. Heat the oil in a large skillet before adding the peppers, onion, and garlic. Saute for 5-10 minutes (depending on how crunchy you want the peppers), then add the tomatoes and reduce heat to low. Let simmer for 3-5 minutes before adding the balsamic reduction, stirring well to coat the toms and peppers. Add salt and pepper to taste. Optional: Serve with fresh cilantro, basil, or other fresh herb of your choice. Mix together balsamic vinegar, brown sugar, and soy sauce. Boil for 15 minutes, stirring occasionally, until you have about 2 ounces of fluid remaining. It should be thick enough to coat a spoon when dipped in it. Regardless of quantity, a balsamic reduction is made by halving the amount of liquid you began with. Four ounces will be reduced down to 2 ounces, and so on. It is traditionally made with only balsamic vinegar, but other ingredients such as brown sugar or citrus will impart additional flavor to the reduction. This can be made for this recipe with only the balsamic vinegar, but I enjoy the slightly-sweet flavor that the brown sugar provides. This entry was posted in Recipes and tagged balsamic reduction, balsamic vinegar, fajita filling, peppers, saute, taco filling by Steph. Bookmark the permalink. Looks delicious! We went on a bell pepper binge a while ago, as our supermarket had a “buy 11 for $10″ deal. Challenge accepted. thanks for sharing at #SmallVictoriesSundayLinkup …hope to see you again! It’s funny how our tastes change sometimes. I find myself eating foods I never would have eaten years ago. Yum, yum! 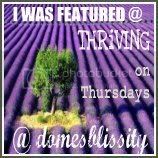 Thanks for sharing at Thursday Favorite Things! Sounds wonderful! What a great side for a BBQ. Thanks for sharing at the #HomeMattersParty – we hope to see you again next week. It would definitely be great with a BBQ. Good idea! These look so yummy. My two little girls love fajitas so I will be trying this shortly. Those vegetables look so inviting and healthy, not cooked too much. Very nice recipe. Definitely a lot healthier than using a processed mix like I use to do. That looks so yummy and I will so have to try this! Linking by from Claire Justine’s Weekend Blog Hop, I blog over at Hooked In The Heart! I ususally just saute in a little olive oil and seasonings. This looks scrumptous. Must try! That was what I would do before too, but I really needed something with flavor for me to really enjoy peppers. Balsamic to the rescue! That’s what I would do before, but they were just still too bland for me. Not anymore! Yay, no more naked peppers for me! Oh, wow…your recipe sounds delicious! I love balsamic and will be trying your recipe…a glaze is my absolute fav! Thanks! Hope you like it as much as I do! I’m new to glazes and am learning just how great and versatile they are. Let me know what you think of it! mmm this looks really good. Yum! If there was one thing I could take with me on a deserted island it would be balsamic. I seriously think it can be used with both both veggies and fruits. Have you ever had a salad with strawberries, almonds, other salad fixings and then balsamic? OH man… it’s amazing! I haven’t. I’m a weird person that doesn’t like fruit in my salad. I do plan to experiment with making balsamic dressing though. I haven’t! I should try it though!